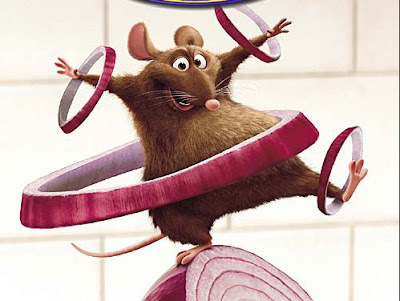 Fourth Dimension: Ratatouille - too good !!! Ratatouille - too good !!! The wait is over. I saw Ratatouille last week with thirty others from my workplace. This is one helluva movie! Pixar’s story telling has hit an all time peak. Apart from the articulate animations, awesome dynamics (cloth, water) and incredible lighting, the story itself is in an all new premise. The ‘Anyone Can Cook’ theme has worked so well in this movie and there is something in it that makes us believe that it could happen in our kitchens too! It was wonderful to see kids bursting out with laughter when Remy trains Linguini blindfolded. Nobody is always right and nobody is always wrong (hmm….except Skinner) in this movie and that lends so much ‘character’ to all the characters. With all the twists and turns, this movie is one journey worth traveling. On the technical side, I really enjoyed the water dynamics in the ‘Remy in the gutter’ scene. The cloth simulation on Gusteau (Remy’s figment of imagination) and wet cloth on Linguini were really cool. They must have had one damn rig for Linguini and that showed in many places, one of them was where Remy tries to wake up Linguini. The visualizations for tastes were a great effort, something never tried before! In a nutshell, Ratatouille is Yummy! he is back with his family. I couldn't agree more Sudarsan !....this movie is made with great taste and it tastes good ! C'est Magnifique ! Pixar surely knows the recipe to success! Haha.. oo dear how cheesy ..